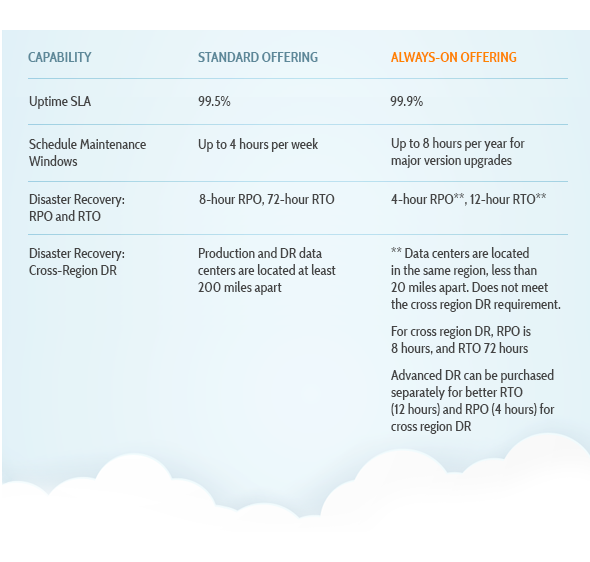 “Scheduled maintenance downtime” is one of the biggest issues with cloud applications. Vendors promise “high availability,” but curtail or suspend service during scheduled maintenance downtime once a month or even once a week. IDC estimates the average total cost of unplanned application downtime for Fortune 1000 companies at $1.25 billion to $2.5 billion per year. Here is the good news: eGain Cloud AlwaysOn changes all that. Designed to meet the critical system availability requirements of our global retail, financial, telco, government, and healthcare clients, eGain Cloud AlwaysOn offers 99.9% SLA without any weekly or monthly downtime. It includes only one annual scheduled maintenance. All updates, enhancements, and patches across the cloud stack—infrastructure, platform, and application—are performed without service curtailment or disruption. eGain AlwaysOn sets a new bar for cloud-based customer engagement solution SLA, no excuses.